A day that neither anyone in the counties of Nassau or Suffolk will never forget is quickly emerging around the corner and you do not want to miss it. Hempstead, NY -March 9, 2013 — A day that neither anyone in the region will never forget is quickly emerging around the corner and you do not want to miss it. 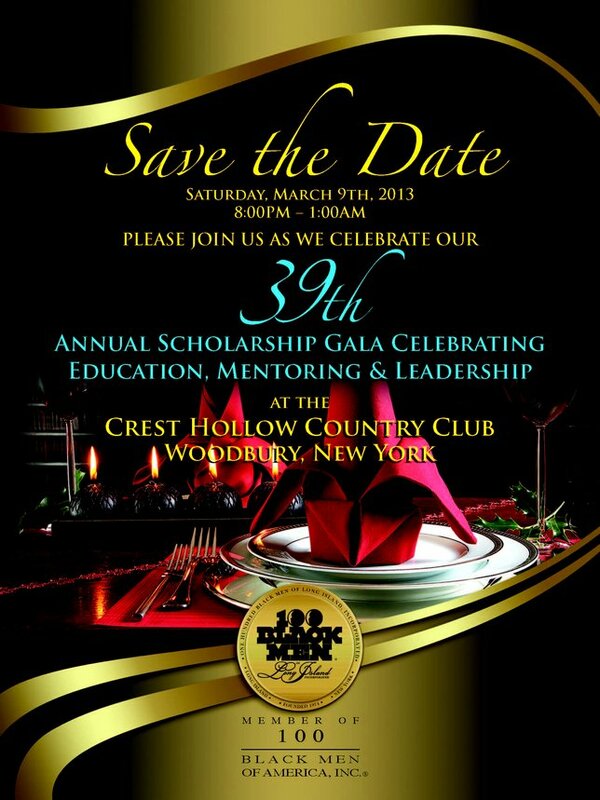 It’s a day of appreciation, it’s a day of high emotions, it’s a day to reunite, it’s a day just for people to see “Real Men serving Real” Time, it’s the 100 Black Men of Long Island, Inc. 39th Annual Scholarship Gala happening on Saturday, March 9th, 2013 from 8pm- until 1:00 am at the Crest Hollow Country Club, Woodbury, NY. The 100 Black Men of Long Island, Inc., Annual Scholarship Gala celebrated annually in the spring is a premier benefit event. Donations and sponsorship from this affair fund and support scholarships awarded to high school and college students, African American History Academic Challenge (History Bowl), mentoring programs, Dollars & $ense Financial Literacy Program, and various other programs of the 100 Black Men of Long Island, Inc. The festivity includes an elegant evening of a sumptuous cocktail hour, dinning, live music by Long Island greatest Sauce Band, a silent auction, promotional giveaways, photos, and dancing. Mr. Michael Stevens (Anchor for Verizon’s Fios 1 News) will serve as this year’s Master of Ceremony. For the previous years, this event has been a huge hit -as it has sold out in advance for years, it is expected to do the same this year. Some 550 people are expected to fill the grand ballroom at the Crest Hollow Country Club. This year’s Gala Honorees are Mr. Thomas P. DiNapoli - N.Y. State Comptroller, Mr. Jon Cooper- Co-Chair, Tri-State Region, Obama Victory Trustees -Obama for America, Dr. Kenneth K. Saunders-Officer in Charge of Nassau Community College, Ms. Lorraine Aycock- Market Manager of Bank of America, Mr. Timothy M. Williams- Chairmen of the Board Nassau County Industrial Development Agency, Mr. Anthony Woods- V.P. of Marketing & Sales Health Plus an Amerigroup Co., Mrs. Sharise E. Beatong-Hall- Financial Services Professional Agent, New York Life Insurance Co., Mr. William Suggs- National Regional Director for American Association of Blacks in Energy. Subject: LongIsland.com - Your Name sent you Article details of "The 100 Black Men of Long Island, Inc. Set to Present Its 39th Annual Scholarship Gala Benefit"